This week’s cash prices ranged finished quite strong with the bulk of them at 120 and 120.50 reported out of Colorado, fully steady with last week’s trades. Dressed sales 186 to 190$. Basis was 3$ over the August Live board. The reports came out post COF, but I cannot confirm if any of the 120 sales occurred post COF. Estimated weekly slaughter was 622K head, 25K larger than the same week last year. Box prices in the PM report where 206.91 choice, and 194.8 select with a 12$ spread. Seasonally the spread should be topped out and cash prices should stabilize through September. The week ending July 7th showed steer carcass weights up 7# versus the prior week at 866#, remaining 9 pounds under last year. The USDA has that marginally abovethe 5 year average. Weekly beef export sales were 12400 MT for the week ending July 13th. Down 1% from the prior week and 7% below the 4 week average. The Cattle on Feed, at first glance, is shockingly bearish with all three data sets missing estimates to the bad. I would expect a very negative market reaction to this report for a while. The Placed number is obviously the big shocker and I will focus my attention on that. I am not an expert on the creation of these reports or the estimates, but I do wonder why, with last months placement number at 112%, we were expecting such a dramatic decline this month to 106%. Especially when we knew we had early placements out of the drought areas. On that topic, I do not have the ability to prove this, but the report does include some data that would suggest at least a part of the 116% placed was movement out of the drought areas. Placed cattle weighing less than 600 lbs was 85,000 more than the same month last year. Of the 240K increase in cattle placed this year vs last year, 35% of them where less than 600lbs. If we consider early sale yearlings as the 600 to 700 lb category, that increased 60,000 over last year. The two light categories combined make up 61% of the 16% increase. As for the rest, for three months we have been building inventory. I would not have expected that to change. If we look at the placed number on a state by state basis, the biggest increases where South Dakota at 167%, Minnesota at 125%, Iowa at 133%, and Colorado at 119%. It’s hard not to notice the geographical proximity to the Northern drought. Especially South Dakota at a whopping 167%. Full disclosure, Texas and Oklahoma came in at 118% and 121% respectively. The fact that the estimates missed so badly also suggests that some influence altered the normal pattern used in estimating such things. I feel that the drought has clearly influenced the placed number, albeit we would be placing large numbers of cattle without the drought. Of course, what I think can’t be proven for a month or two, if/when we see the placed number below expectations. In the meantime, my opinion doesn’t matter. What matters is how the market “feels” about this placement number. All indications so far are; the market doesn’t like it. 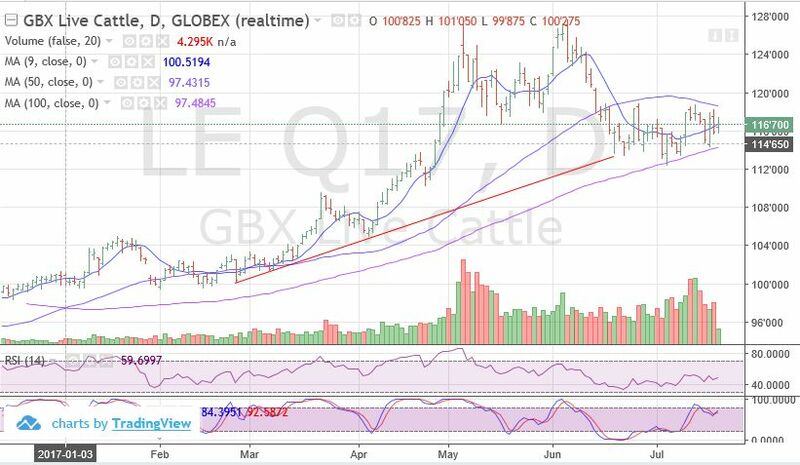 August Live: August live has stabilized into a sideways pattern, ranging between 119 and 112, with this week still threatening to break through the 119 level. The 5, 15 and 30 year historical patterns all show strength through the 10th of August. 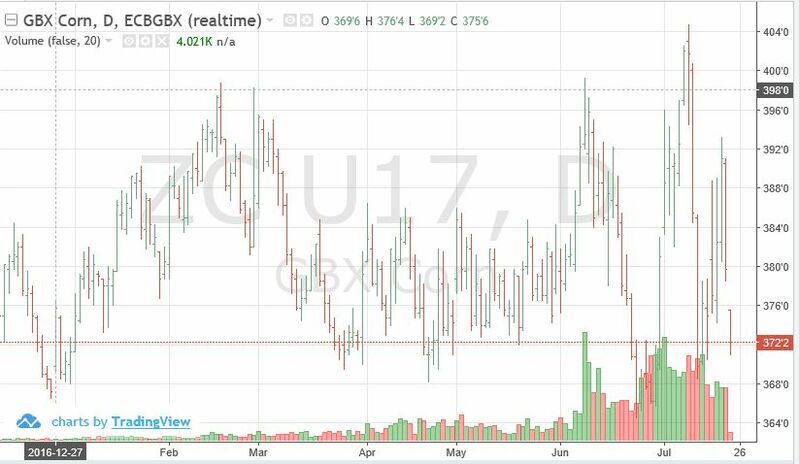 Feeder Cattle; Positive feeder margins and seasonals are supportive to the feeder market, but future break evens using the 2017 Feeder boards and the April/June 2018 Live boards are tough. 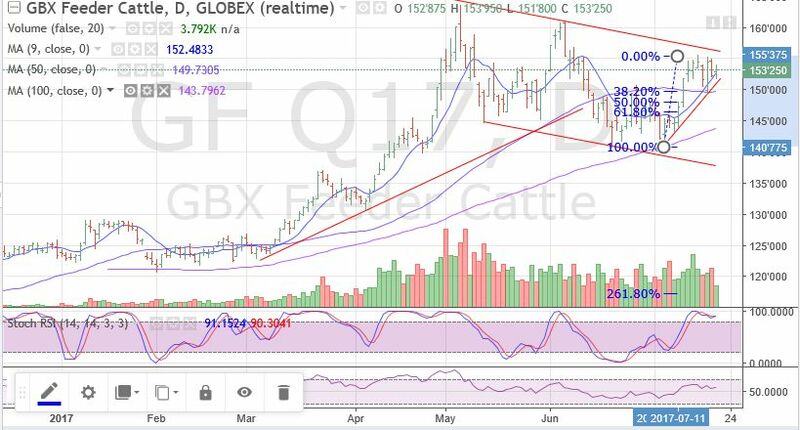 The CME feeder cattle index is at 149.03, down about 2$ week over week. The index is about 4$ under August Feeder futures. August Feeders have a very nice looking chart with consolidation immediately under the top of the channel. If not for the bearish COF report, I would fully expect a break out of the channel and a run at 165. However, with the COF one has to expect at least a sharp correction to 146, and quite possibly a run back to the bottom of the channel at 138. Seasonals turn higher through August 10th. Last year saw a May 20th high that was not to be matched for the remainder of the year. It also recorded an August 10th high for the months of June, July, and August. For now, the 2017 chart shows a yearly high on May 4th. Are we yet to set a June, July, and August high? Short term trend for August feeders is Neutral. Stochastics gave a fresh buy signal. For clients that will not be forward contracting any time soon, August 150 puts were rolled down the end of June. Given the large premiums, the math didn’t work as well as we normally like. However, given that “time value” has gotten so expensive we felt it critical to put some cash in the client’s pockets. We KNOW that by the end of August the nearly 6$ of time value an at the money put holds will be zero. We rolled positions back up last week, regaining lost protection for 1$. Several other puts were also rolled up a 1:4 ratio. I forward contracted my 630 lb calves for 8$ over the Oct feeder board Thursday (5/11), and placed long futures against my slightly in the money May puts. May expired and due to the risk structure of this trade, I made nothing, and lost nothing. I bought 160 August calls on the India news for 2.65 (5/31). The 160 calls are still in the game but with the COF, not feeling real great about them again. I will let them run their course since the risk is so minimal. You never know what is going to happen. We probably need to let the market settle out a little before contracts become available again. Hope I am wrong.